Google Translate is a free iPhone app that lets you say or type any word or phrase, and translate it into one of 57 different languages. You can either type in the text you want to find and or tap the mic icon and just speak what you want into the iPhone and Google Translate will show you the results in the language of your choice. Results can be read in your translated language. Rotate your iPhone to the landscape view and the app enlarges the text to fill the entire iPhone screen for super easy reading. This full screen mode will be very helpful if you’re abroad and want to show the text to someone for them to read. If you prefer to pronounce the words, Google Translate also provides you with phonetic text that you can pronounce yourself. This makes the app even more useful. Making the effort to pronounce words, even if with a broken accent, will get you more points with locals. Finally if you like to listen to how the phrase is translated, tap the speaker icon and Google Translate will play the audio of the text for you in the foreign language. Not all languages support this speaking feature. Google Translate keeps a history of your searches which you can get to easily later, and you can “star” your favorites for quick reuse. The starred and history content is available while in Airplane mode, although you can’t perform brand new translations while offline. We tested this app with Portuguese, French and Japanese. It was quite accurate going from English to French and English to Portuguese. It was also very exciting to see it converting spoken Japanese voice into English text, perfectly. We even tried some slang and insult phrases and were amazed at how accurate the translations came out! 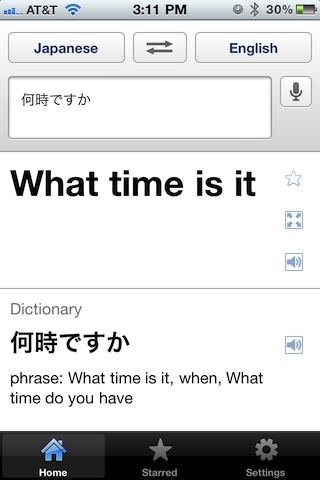 When going from English text to Japanese translation however, the phrases it translated were a bit off. It seems like the logic was translating words in a different context, which led to semi-accurate translations. Overall, if you’re going to be doing any sort of traveling, or communicating with someone in a different language, Google Translate is a killer must have app. The fact that you can just speak your words is just awesome, plus the app is free. AppSafari review of Google Translate was written by Joe Seifi on February 8th, 2011 and categorized under App Store, Enterprise, Free, Reference, Travel. Page viewed 8116 times, 2 so far today. Need help on using these apps? Please read the Help Page. I am learning French and I use Google Translate (web version) very often. Its extremely useful tool. I would love to have this one on my iPhone. Thanks for sharing the review. Oh wow, this is an absolutely amazing app… I’m utterly shocked that this app is free. Awesome! Thanks for the post. Just in time. 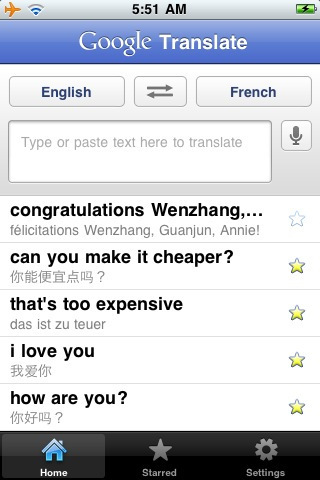 I needed this app, because I was going to China and I don’t know any chinese, and so I’ll download this app on my new awesome Iphone! its fantastic – i don’t even know how i managed without it 🙂 it make life so much easier! It is a helpful app. As I have to work on different languages in my development work. It really helps me a lot. Explore new horizons of your business projects with custom mobile applications development via http://appyresto.com app maker! Build apps for education, wedding, joy, entertainment lawyers and law firms.